Monkey D. Luffy is back! Yes, Monkey D. Luffy is actually someone's name. Well, a fictional someone's name. Burning Blood brings the weird world of One Piece back to gaming, along with all the wackiness that entails. For those new to the series - it spins out of a manga with some 81 or so tankobon volumes, and 744 anime episodes, behind it as of the release of Burning Blood. Monkey D. Luffy, a chap whose body took on the properties of rubber when he ate a devil fruit, is the star. Him and the Straw Hat Pirates criss-cross the high seas searching for a mythical treasure known as 'One Piece' so that he can become the King of the Pirates. 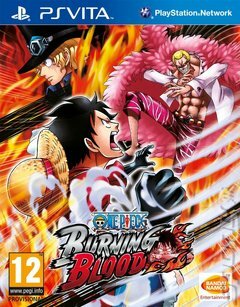 Burning Blood adds a brand new story to One Piece's epic body of work, bringing together a huge number of characters to face off against each other in a massive beat-'em-up. Alongside the series hero, players can expect to fight with the likes of Sabo, Ace, Bartolomeo, Ener, Crocodile and Bartolomeo in three-on-three brawls. You can switch between characters at will and combine them for special assists or bust out special moves with the help of Logia fruit. Rather than stick to the usual 2.5D battlegrounds seen in the likes of Street Fighter, the game has you duke it out in huge 3D arenas, complete with plenty of destructible objects you can smash your opponents into. As well as the story mode, the game offers online play, a store for buying new characters with in-game currency, 'Wanted' challenges in which you hunt specific characters and an online war mode that has you pick a side in a pirate war and score wins for your side of choice!